Walt Disney Animation Studios builds on the overwhelming success of recent hits Frozen and Big Hero 6 with their latest effort Zootopia, which largely takes place in the titular city inhabited by anthropomorphic animals who have learned to peacefully co-exist with one another. When new rabbit resident Judy Hopps (Ginnifer Goodwin) joins the city’s police force, she crosses paths with cunning con artist fox Nick Wilde (Jason Bateman) and the two team up on a desperate search for a missing otter. As it turns out, the initial case runs deeper than they both realize and they slowly uncover a conspiracy to divide their seemingly tranquil society. The most immersive animated films are those that seek to create an entirely original world for their characters to inhabit and this is no exception. The implicit challenge here lies in how these mammals of varying shapes and sizes could plausibly interact with one another despite their differing circumstances. Clever solutions, from the partitioning of different living sectors based on their corresponding climates to appropriately sized pneumatic tubes designed for transportation of smaller creatures, crop up throughout the movie and remind us that the creators put loads of thought into how to make this world work logistically. By this token, a great deal of attention is paid not only to how the varying species physically co-exist but how they view one another from a cultural perspective as well. After all, this is a world where the traditional food chain has been narrowly circumvented but that doesn’t mean they’re still free from the kinds of nuanced divisions inherent in every civilized society. 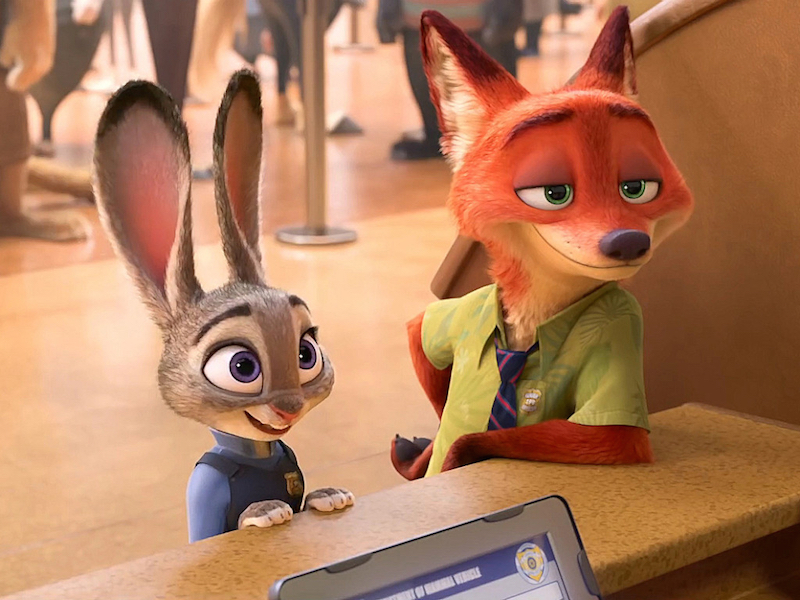 The prejudices and microaggressions (Judy rebukes Nick at one point for calling her cute, as only bunnies can call other bunnies cute) that pop up between the prey and predator factions are incisive bits of humor that cut deeper than the typical slapstick fare that pervades the animated genre. With these topics in mind along with sprinkles of overt allusions to other high-minded entertainments like The Godfather and Breaking Bad, this is a film that is clearly aiming for an adult audience but even if taken at face value, Zootopia is plenty entertaining for all ages. The action scenes have a vibrancy and brisk pace to them, while the animation is consistently breathtaking and full of rich detail. Despite having likely recorded their vocal parts completely independent of one another, Goodwin and Bateman still manage to form a palpable chemistry among their witty banter. The film’s story, which is a great throwback to film-noir inspired mystery, is surprisingly involving for the first hour, until it gives way to predictable contrivances that split characters up just in time for the third act. For as smart as it is for most of the running time, Zootopia does dumb itself down more than it should have and more than it really needed to towards its ending. Still, this is a consistently enjoyable movie with plenty of laughs for kids and enough social commentary to keep their parents engaged too.